Can you find your property on our map? Can you tell us what's missing? Do you know the name of any of the streams not yet named on this map? Please email us with the name and we'll have our professionals add them to the map and we'll update it on the original. Identify which section your property is in, click on that section, and download the corresponding PDF map of that section. This is a very large and detailed map, but we've sectioned it so that each section is a size of a 8 1/2 by 11 page so you can print it on your printer. The Conditional Use decision contains some significant victories. While the “Greenfield Ordinance” allows a development that is contrary to the best interests of the community, within the confines of that ordinance, the Guardians achieved important improvements through the Conditional Use process. Through our efforts, if the ordinance ultimately stands, we have prevented this plan from being far worse than it could have been. Residential setbacks - All proposed residential buildings shall have a minimum setback of 100 feet from any Residential Zoning District boundary, and all proposed non-residential buildings shall have a minimum setback of 200 feet from any Residential Zoning District boundary. Accessory buildings and structures shall have a minimum setback of 25 feet from any Residential Zoning District Boundary. a. Up to 5% of the entire 150 foot riparian buffer area may be disturbed, provided that the area of disturbance must be a minimum of 50 feet from any water course, body of water, or wetland, to the extent necessary to permit: existing structures; new structures in the areas of the Manor House and at the base of the quarry; existing trails; utilities (including, but not limited to, approved sewer and water facilities), subject to the approval of the Township Board of Supervisors in consultation with the Township professional consultants; and stormwater management facilities (including basins and other related facilities), subject to approval of the Township Board of Supervisors in consultation with the Township professional consultants. Adequate engineering measures shall be incorporated by the Greenfield to protect against the possibility of outflow to the buffered water course during construction or operation of the structure and to prevent, to the extent reasonably possible as determined by the Township Board of Supervisors, any other deleterious environmental impacts. d. No more than five (5) new stream crossings shall be permitted, the locations and design of which shall be subject to approval of the Township upon consultation with the Township's professional consultants, during the preliminary subdivision and land development review process. Groundwater - Groundwater generated by wells installed on the property cannot be exported from the property or used to increase water levels in the Cornog Quarry. Golf Course Lighting - Neither the golf course nor any component thereof shall be utilized after sunset or before sunrise. The golf course shall not be lit for nighttime use. Sewer - Stream discharge from the wastewater facilities shall not be permitted. Woodland Preservation - Greenfield shall incorporate the maturing to mature woodlands into the Greenway Land. Such woodlands are characterized by a canopy dominated by tulip tree and other species, including beech, hickory, red oak, ash and walnut with spring ephemerals within the understory. The woodlands also contain invasive understory plants, such as multiflora rose, shrub honeysuckle, autumn olive and vines. The exact boundaries of maturing to mature woodlands shall be identified on the Existing Resources and Site Analysis Plan submitted during the preliminary subdivision and land development plan review process, and in accordance with Section 401.D of the Township Subdivision and Land Development Ordinances, trees within the Greenway Land shall not be removed except for selective cutting of trees: 1) that are dead or diseased; 2) necessary to install utility lines, including storm sewer lines, sanitary sewer lines, and water lines; 3) to establish or maintain trails or the health of wooded areas, as approved by the Township; and 4) to manage the woodlands by removing invasive plant species. Gambling - The Property shall not be used for gambling purposes. Greenfield shall deed restrict the Property in perpetuity, in form and substance approved by the Township and Township Solicitor, to preclude the use of the Property for gambling, a casino use, or any slot machine use. Time Shares - Time shares shall not be permitted. Greenfield shall deed restrict the ject Property in perpetuity, in form and substance approved by the Township and Township Solicitor, to preclude the use of any of the approved residential uses as time shares. Greenfield shall also incorporate restrictions in the condominium association documents, in form and substance approved by the Township and Township Solicitor, in order to preclude the use of any of the approved residential uses as time shares. Golf Course Conservation Easement - In the event that the proposed golf course, or any portion thereof, as approved during the subdivision and land development review process, is not constructed or is abandoned, the area approved as the golf course shall be maintained as undeveloped open space. The area comprising the golf course shall be subject to a conservation easement held by the Township, which easement shall be monitored by a third-party, such as a land trust or conservancy, approved by the Township. The area approved as the golf course shall be deed restricted in perpetuity against any use other than: the golf course or other recreational use as approved herein and through the subdivision and land development plan; or as undeveloped greenway land. Township supervisors Thursday night (November, 5, 2009) unanimously approved the conditional use of a 606-acre property to be turned into a golf club resort and community. Now Is the Time for Wallace To Stand Up & Protect The Brandywine ! It is a delicate balance between property rights and the health, safety and welfare of the public, especially when it comes to our valued resources. Natural resources have no voice and are not members of any political party. Our precious water resources, woodlands, wildlife and watersheds depend on all of us (you and me) to protect, defend and sponsor them. They not only add esthetics, character and property values – but are essential to our every day life. For example, many people depend on the Brandywine watershed for their drinking water. Wallace township has an opportunity to step up and set an example for Chester County in the protection of her natural resources – specifically, the Brandywine watershed. The Board of Supervisors can re-enact comprehensive environmental ordinances which will protect the woodlands, provide buffers and storm water protection for the waterways as well as set standards for environmentally responsible development. Beyond those ordinances, they can and must put proper controls on future development in the township to ensure that natural resources are respected and protected. We simply cannot rely on outside regulatory agencies to do our job of legislating, monitoring and enforcing the necessary legislation and requirements which will ensure that our resources will be protected. What happens in Wallace will have an effect on many of her neighbors downstream – especially Downingtown – and beyond. 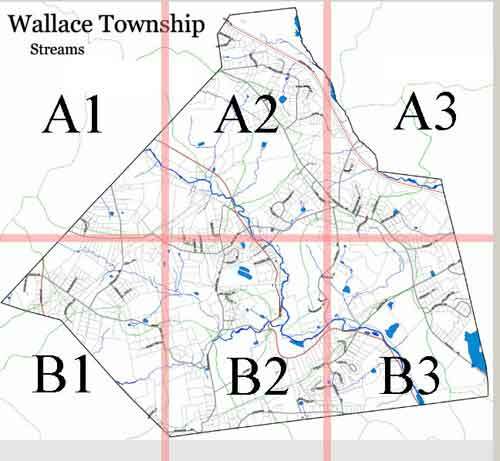 To assure adequate protection of Wallace Township’s streams; storm water modeling, monitoring and sampling by a storm water specialist must be required in order to bridge the gap between available science and the practices currently in place. Will Wallace Township meet this urgent challenge and set an example for stewardship of the Brandywine and her valuable watershed? Hopefully with sound environmental ordinances and development practices, Wallace Township can protect this high quality stream and prevent serious damage to the watershed and costly flooding downstream. The Guardians of the Brandywine, through its legal counsel and experts, has challenged the developer’s claims through Wallace Township’s Conditional Use hearings. By cross-examining the developer’s expert witnesses, we have shown that the developer’s claims about an “environmentally-friendly” project are nothing more than smoke and mirrors. Also, through the testimony of nationally recognized experts – Land Planner Thomas Comitta and Environmental Scientist Allan Haberstock – we have revealed that the risk that the project poses to the Upper East Branch of the Brandywine River and to the health, safety and welfare of the community. While continuing the battle through the Conditional Use process, the Guardians are gearing up for the next stage, which will be hearings before the Township’s Zoning Hearing Board. At the Zoning Hearing Board, we will marshal evidence to show that the Township enacted an ordinance specifically to benefit the developers of the proposed destination resort, that the ordinance is contrary to sound planning. Alan Haberstock, from Kleinschmidt, Energy and Water Resource Consultants (an environmental service provider), gave testimony for the Guardians of the Brandywine, Inc on Tuesday, April 14, 2009 and April 21, 2009 at the Wallace Township Building. Read the full report. in Wallace Township, Chester County, Pennsylvania. and can be downloaded now for you to read. He has not demonstrated his water needs and where all the water will come from. He has not demonstrated how on site sewage will be handled. The current proposal to use sewage water to irrigate the golf course violates Wallace Township zoning ordinances. The application does not include a Manual of Written & Graphic Design Guidelines which is fundamental of all traditional neighborhoods. The application does not provide any information about building materials to be used or architectural details as required for conditional use proceedings. The plan violates slopes exceeding 20% which conflicts with Wallace Township zoning ordinances. The plan violates water buffers which conflicts with Wallace Township zoning ordinances. The applicant has not agreed to LEED-NC for Multiple Buildings and On-Campus Building Projects. The plan relies on Audubon International to enforce environmental standards. This group has no legal authority to enforce Township ordinances or any violations. The sound testing performed was grossly inadequate and in does not comply with Wallace Township Zoning Ordinance. The plan and project violate the meaning and spirit of the existing Wallace Township Comprehensive Plan which should be upheld. Wallace township had a public hearing on August 21, 2008 at their township building in Glenmoore. On the agenda was Ordinance 1323 (which you can download and read here). This newly adopted zoning amendment and any future zoning ordinances will affect the disturbance of the natural resources in Wallace Township. Part of what makes Wallace so unique is the large amounts of wooded and natural resources along the streams of the Upper East Branch and the Indian Run. As High Quality streams, the East Branch of the Brandywine River and Indian Run require special protections to make sure they are not degraded by pollution or stormwater runoff. Our forested buffers and canopy need to be preserved to protect our quality of life and our rural character, as well as our water and air quality. WOW believes that it is important that the public be educated regarding environmental protection standards and how they can be used to protect our resources. On February 24, 2009, the proceedings would be put on hold until the completion of the Conditional Use proceedings. Also on the 24th, the Conditional Use Hearings resumed with the cross-examination of Albert Greenfield, III. The Guardians' attorney was successful at securing agreements from Mr. Greenfield on specific changes he would make to the project. At the same time, Mr. Greenfield, refused to agree with repeated recommendations made by his own consultants, further revealing the smoke-and-mirrors nature of the testimony presented by Greenfield's witnesses. The hearings will resume on March 10, 24, 31, April 14, 21, and May 5 and 19th. We expect Mr. Bodie from Audubon International on March 10, and the Guardian's planning expert, Thomas Comitta on March 24 and 31. On Thursday, Aug. 21, despite many requests to postpone the decision, the Wallace Twp. BoS unanimously passed PCCC 1323. The requests to postpone came from township residents as well as the Chester County Planning Commission who had submitted a letter expressing their opinion of PCCC 1323. The letter from CCPC recommended that the BoS delay their vote and reconsider this change in terms of the Wallace Township Comprehensive Plan which currently does not provide for a destination resort. The six page letter describes many other reasons to delay the vote and you can read it in its entirety in the document available for download. I'm sure as you read it you'll wonder why the BoS decided to move forward with this vote when the CCPC expressed no statements of support regarding this change. To support their decision, the BoS inferred that CCPC did not have all the information needed to evaluate PCCC 1323 and also offered that the township consultant's (who participated in the composition of PCCC 1323) disagreed with the CCPC review. The CCPC knows their business - they review ordinances regularly and make impartial recommendations. By dismissing the recommendations of the CCPC and voting in favor of PCCC 1323, we think the BoS did not act in the best interest of Wallace Township. requirements for a stand alone well head protection standard for all new community or public wells. Wallace is the headwaters for the East Branch of the Brandywine. It was originally part of the Springton tract reserved by William Penn for his own relatives. A diagonal line shows where Wallace was broken off from West Nantmeal Township in 1852. It's name for the village of Wallace where the old general store and post office are still located. Ferguson Farm, circa 1741, named for its first occupant, William Ferguson, is on the National Register of Historic Places. Joseph Smith preached at the school that is now called Wallace Seminary sometime before 1842. He converted Edward Hunter and his family, who then owned Ferguson Farm, to Mormonism. Hunter sold the farm, moved west with other Mormons, and eventually became a bishop of the Church. Smith was murdered in Illinois in 1844. A railroad use to run along the east bank of East Brandywine Creek from Honey Brook to Downington. It stopped at the village of Cornog, named for John Cornog, who lived at Ferguson Farm 1842-85 and was the first president of the railroad. Springton Mill, on the right side of Creek Road just west of Marshall Road, was in use from the mid-eighteenth century until 1922. Albert Greenfield, III is currently going through conditional use hearings for Valhalla Brandywine; a 600 acre community consisting of 280 high-density housing units, a 170 room hotel, a 320,000 square foot spa/recreation center, and golf course. He and his lawyers helped write the language contained in the ordinance. Not even a week after the ordinance was adopted by the BOS, Mr. Greenfield applied for conditional use under the PCCC ordinance. Most developers take months to analyze ordinances to make sure their development complies. Mr. Greenfield did it under a week!  The PCCC ordinance was inconsistent with the township comprehensive plan, which does not define a PCCC. The MPC Code says all zoning and ordinances must be consistent with the comprehensive plan.  The language used in the ordinance was so broad that a destination resort could have been built almost anywhere in the township, which is inconsistent with the current Chester County Comprehensive Plan.  The CCPC recommended that township consider other locations where a destination resort could be placed so that it minimally impacted the vegetation, woodlands and storm water flow. They also recommended the township consider how water and sewer services will be provided so that this development protects sensitive resources like the Brandywine Creek.  A destination resort should be on or near collector roads. In other words, it should be located on big roads like highways, not single lane country roads.  The use of pesticides, herbicides and fertilizers should be further defined and how runoff of these materials will be controlled needed clarification. The ordinance calls for the PCCC to comply with the “Audubon Gold Signature Sanctuary Program” which is not the same group as the Audubon Society. The “Audubon Gold Signature Sanctuary Program” is run by a private group and is not governed by municipal authority. In other words, the standards used to govern environmental protection are unenforceable. Disturbed by our elected leader's enactment of this ordinance, a group of community minded citizens have formed the Guardians of the Brandywine, a grass-roots organization dedicated to the preservation of the pristine environment that we call home in Wallace Township. Our goal is to educate the citizens and elected leaders of our wonderful township about our vast natural resources so that they may be preserved forever. We are not anti-development; however we expect that developers and politicians will respect and maintain the land, wildlife, and natural buffers to protect our hidden gem of a rural township. We wish to talk with all residents in Wallace and hope that you will contact us at www.watchourwaters.org . Despite concerns and protests by many residents and with the full knowledge that the Chester County Planning Commission had recommended that the township “defer action on this particular amendment”, the Wallace Township Board of Supervisors approved PCCC 1323 – Planned Country Club Community in the early morning hours on August 22, 2008. Chester County Planning Commission did not endorse PCCC 1323 as written. These are but a few vital recommendations made by the Chester County Planning Commission which draw attention to the fundamental need to provide vital core environmental protections for our valuable resources including the beautiful Brandywine . & STORMWATER RUNOFF CONTROLS NOW!!! In April of 1999 Wallace Township was honored in Harrisburg for the 1999 Governor's Award for Local Government Excellence for their award winning approach to development. Most awards were given for fiscal responsibility and community programming, this was the first time a town had been honored for its land -use approach. Bitten Krentel, Director of the Wallace Trust, was there with eight other residents to receive the award for her stellar work in conservation efforts to preserve the rural quality of Wallace, and guide development away from sensitive environmental areas, using new land- use principals. Bitten understood that it would be difficult to preserve farming, and the Township could not avoid development, but the Wallace Trust and the Township officials made every effort to preserve natural resources and protect the country look. All of the 3,000 + residents until this day have lived tucked behind forested areas, they enjoy having the pleasure and responsibility for protecting and maintaining the state designated 'High Quality' streams in Wallace. With the help and guidance from the BOS, the Wallace Township's newly formed EAC applied for a Vision Partnership Grant in the Winter of 2005. With members of the Planning Commission, several residents, Mark Gallant from the Chester County Planning Commission and the Northern Federation, they formed the Woodland Task Force led by the Committee Chair Dr. Maryanne Zediers, a long time resident of Wallace. The Brandywine Conservancy was represented by Mr. John Snook, Senior Land-Use Planner and Robert Lonsdorf, to establish the legal validity for the proposed new Ordinances. After several years of research, public meetings and outreach educational programs the EAC passed the ordinances along to the Planning Commission and the BOS where the ordinances were passed and enacted on October 3, 2007. The township's newly adopted woodland preservation ordinance was awarded a $ 500.00 check and an award from the EAC network, a division of the Pennsylvania Environment Council , at the 10th Annual Southeastern Pennsylvania Regional Conference for environmental advisory councils. The award was given at the American College in Bryn Mawr. Mary Anne Zeider the Chair accepted the award for her outstanding accomplishments in steering the Woodland Task Force towards the adoption of the ordinance. Dr. Zeider, who was also the Chair of the Environmental Council, formed ordinances to identify, analyze and protect priority woodlands, forests, riparian buffers, wildlife, rare and unusual species and watershed resources. Part of the work for the Task Force involved a survey of native and non-native plants in the township. The two biologists found that Wallace has the greatest number of native plant species out of seven species in Chester County. We, the Guardians, applauded Dr. Zeider's outstanding work in stewarding in new conservation standards for Wallace Township! Come support the Guardians by coming to the next conditional use hearing in Wallace Township. We are trying to protect the waters of the Upper East Branch of the Brandywine. You can help by showing your support. 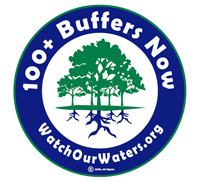 Support 100 foot + Buffers! Move Wallace toward the protection of our High Quality streams! Support 100 foot plus buffers for the Brandywine. Buffers are a source of economic capital, preserved and protected they mitigate stormwater naturally. They are nature's best management practice. Visit our online store to purchase clothing, buttons, stickers and the like to show your support!